New G7 Ezy Farmnavigator: Intelligent farming, made easy. AvMap launches a new entry level product of the Farmnavigator series dedicated to intelligent agriculture. G7 Ezy Farmnavigator is affordable and easy to use, it can be adopted by farms of any size. Ideal for basic operation such as weeding, fertilizing, spraying. If you thought Intelligent Farming technology was not for you, G7 Ezy Farmnavigator will change your mind. G7 Ezy Farmnavigator features an incredibly bright 7” sun-light readable display with 16 million colors. The bonded LCD reduces the reflections, increases the contrast ratio, and eliminates condensation. Dust and water proof, is Suitable for use on tractors without a cab. The display is covered edge to edge with hard glass that can be easily cleaned from dust in one swipe. The software is farmer-friendly, with a very intuitive interface and large buttons for each function. You can use multiple finger gestures on the Multi-touch display to scroll menus, or to zoom in and out the field view by stretching and pinching with two fingers. 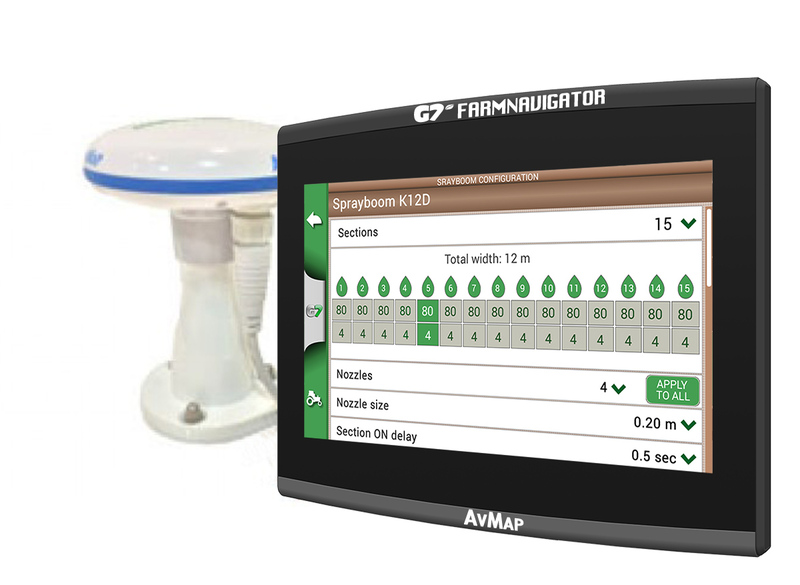 G7 Ezy Farmnavigator comes with a simplified Graphic User Interface to help the operator easily choose the right settings, follow the guidelines and managae data. The Advanced Section Control lets you close or open manually a section from the G7 Ezy display forcing the automatic control. Improved data management: for each Job, G7 Ezy sales farmer, activity, field, implement and products used, worked area, total time etc. Last, but not least, the FARMNAVIGATOR series are now complete with a full range of useful accessories such as power adaptors and connection cables for any need, and you can choose the right DGPS receiver to fit your precision requirements. Visit avmap.it/IntelligentAgriculture for more info!